Start your own revolution for better health and become more fulfilled by starting a minimalist lifestyle. Today, we are constantly under pressure to live up to the standards of living that materialistic companies establish for us. The way you dress, the phone you have, and the car you drive have come to serve as billboards for the rest of the world to know how much your job and you are worth. Every major holiday comes with a whole new line of commercials and advertisements that encourage you to buy the next great thing, or else you will be missing out on a great chance to show off what you can afford. Our worth is constantly challenged by corporations who benefit from the insecurity of always wanting more. Minimalism is the answer to your desire to break away from expectations set up by a commercially driven society. It is a way of life that allows you to let go of the fear of losing your money and possessions, so that you can enrich your life in other meaningful ways. 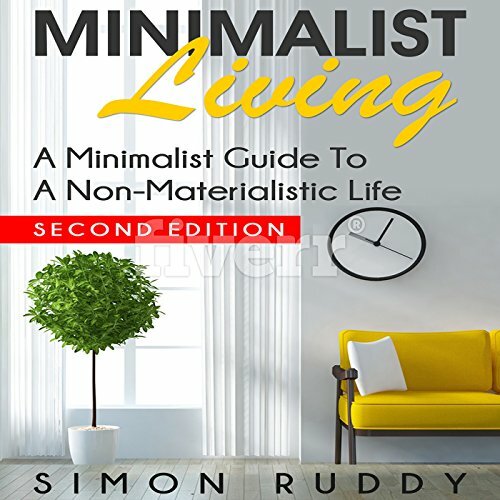 In this book, you will learn what minimalism is, as well as the many ways you may benefit from this lifestyle. You will come to understand the negative effects that material possessions have inflicted on your quality of life, as well as how you can break away from the mindset of needing to fulfill your life with "stuff". How can minimalism improve your quality of life? This book contains proven techniques and strategies on how to truly become a minimalist and live a simpler life that is improved through quality of experiences, rather than quantity of personal possessions. If you feel that you are ready to experience life on a whole new level, then it is time to learn and adopt the minimalist lifestyle. This book will teach out how to let go of your inherent materialistic behaviors and motivate you to be a more motivated and productive person in your day-to-day life. It's time for you to find peace and happiness so that you can live a joyful life without the weight of money over your head. Minimalism will enable you to create a deeper and meaningful bond with the people you love and allow your relationships to flourish without the expectations of money and objects becoming the foundation for successful connections.